ChiIL Out everyone! Embrace the great dress freak out, llamas on the loose, and the lovely absurdity of reality. Truth is stranger than fiction and the truth is rarely black and white or even always black/blue, white/gold. February 25, a day that will live in infamy. It began with an innocent enough question. 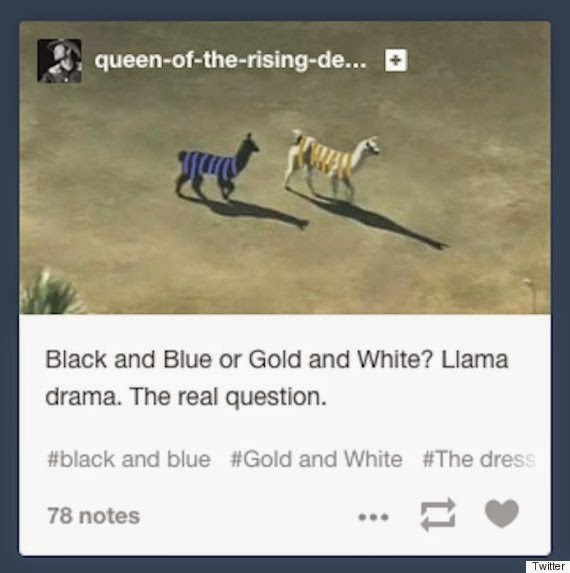 The humble beginnings have been traced back to this Tumblr page, where a user posted a photo of the dress with the caption, "guys please help me - is this dress white and gold, or blue and black? Me and my friends can't agree and we are freaking the f--k out." Then the whole world chimed in! 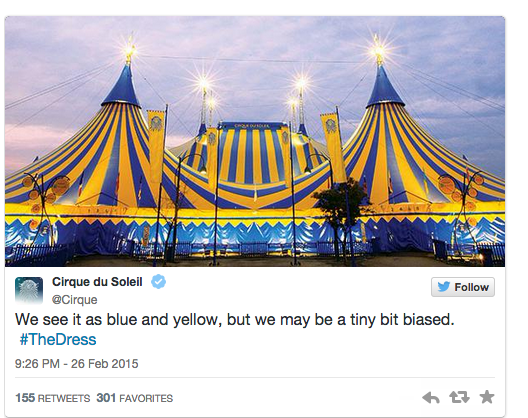 From a wedding on a small Scottish island, #thedress went viral Thursday and consumed the internet! Why? People love a challenge, a mystery, a debate. This one seemed so clear cut and easy. It's not a trick question. What you see is what you get and HOW can so many people see the wrong 2 colors?! Normally I skip clicking on things like this. Who cares about a freaking dress? But there was something of a dare in the headline and it had hit my Facebook/Twitter a startling number of time in a small window of time so I took the bait. 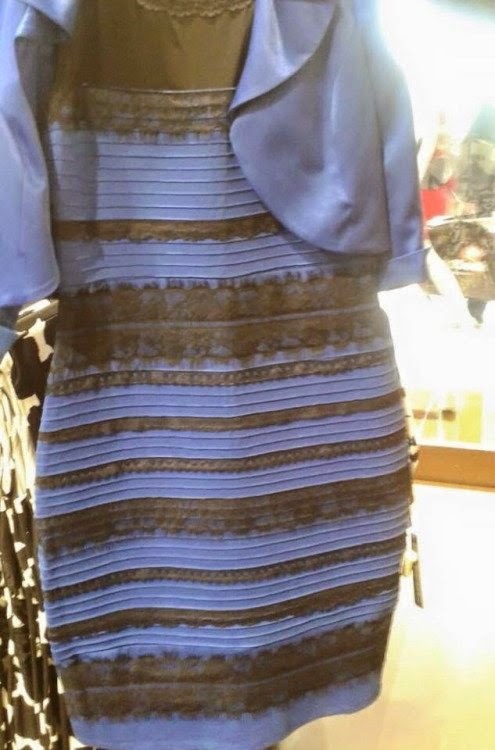 It was clearly gold and white. 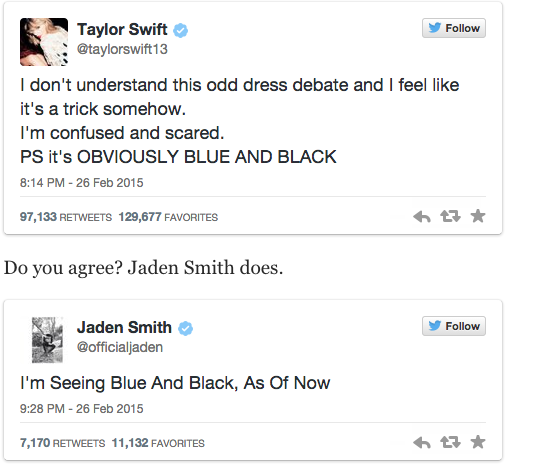 My 11yo daughter saw blue and black and was quite insistent about it. I "wished" I saw blue/black, my favorite color combo ever, instead of the ugly gold/white pairing. I stared for minutes willing it to shift, waiting for the pop. NOTHING. I began to read all the science experts weighing in, the graphs pitting #teamblueblack against #teamwhitegold. Then I looked at the image again and it had magically and incontrovertibly converted to black n blue! Then I couldn't unsee it. I scrolled through the fray, my eyes flip flopping the dress back and forth. I learned from one sciencey guy that white/gold seers were more sophisticated and had eyes that adjusted for the lighting. Blue/black visionaries saw the photo at face value (ie: crappy phone photo in poor light). 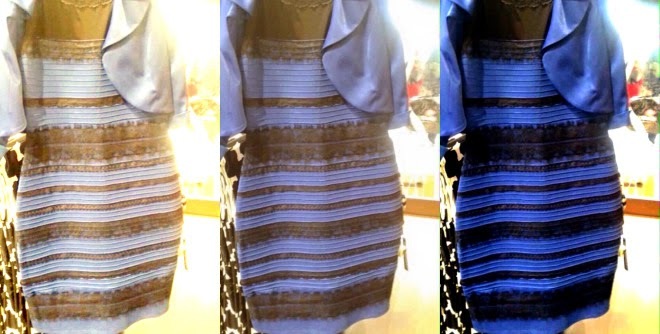 Another sci nerd suggested untested theories that night owls tend to see blue/black while day lovers go gold/white. Yeah, not so muchly. Then every science, tech, medical, expert and their sisters spouted off on the hows and whys of the dress mess. 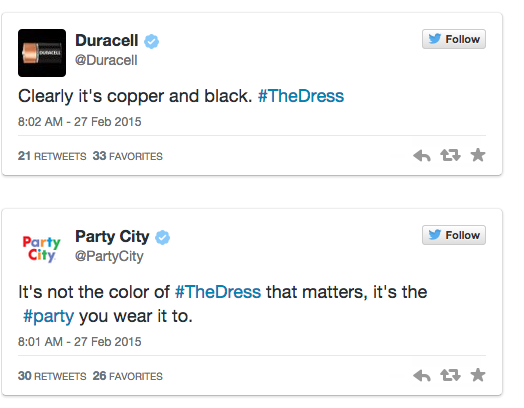 Where were you when #TheDress went viral? Were you a first responder? Are you a luddite, just seeing this days, weeks, months after the initial craze, the parodies, and the endless dissecting have tired everyone of the dress? I work in social media so I saw this fairly early on Thursday and felt a little twinge of pride at being one of the first in the know. Why? Why not? The cadre of experts from neuroscientists and graphic artists, to lighting designers and photo editors were called. Celebs chimed in with their opinions. Social media was in a full on freak out. Then traditional media all began running their pieces in the broadcast news, talk shows, and on line. Everyone had an angle on the dress from the science & technology mediums to the star stalkers. Screen grabs of famous people seeing colors became news at legitimate major outlets like Time Magazine. And everyday dorks got excited to be in a Twitstorm debate with the rich and famous. We predict that in the next wave the creative juices will flow and a zillion knock offs, spoofs, and spins on #TheDress will flood the internet just for fun. 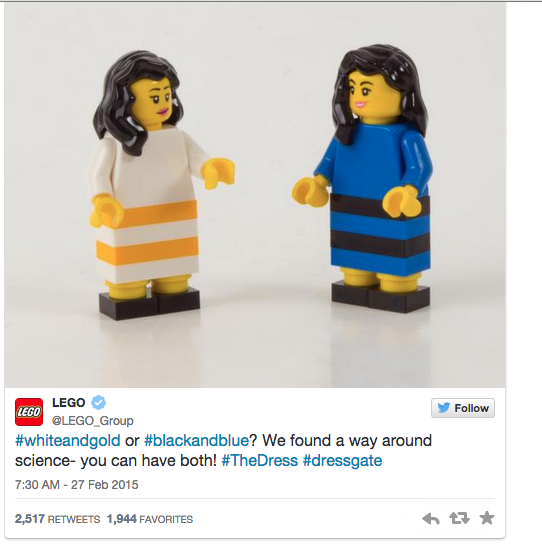 Then advertisers will try to figure out how make a buck, use the dress to sell product or drive traffic. Then people will be utterly sick of the endless dress discourse and it'll all be a memory and maybe a hot Halloween costume for 2015 if our collective memory lasts 8 months. We've become accustomed to stunning CGI effects, internet trickery, photoshopped images and a healthy disbelief of high and low tech optical illusions. But THIS. This DRESS blew my mind. I think this whole dress debate touched a nerve with people, because it seemed so clear cut and not even a close contest, yet people standing right next to each other in real time were seeing a completely different reality. Is there a right and wrong answer? The dress was in actuality black and blue, but if your eyes see white and gold, then that IS legitimately what it is to you in that moment. It's fun to go low tech, with no tricks involved and realize that maybe you can't believe your own eyes. As a photographer, videographer and blogger I spend copious amounts of time shooting and editing photos. It's tricky business. There are HUGE differences in how pictures look depending on technology and biology, which make photo editing tricky. What might look stunning to me on my Macbook Pro may look dark or blown out on someone else's smartphone. And there are measurable gender differences in seeing color (women see a much larger range of colors, shades and variations) and differences between individual people. So right off, color is in the eye of the beholder. And everyone has their own unique version of "reality". This was a fun diversion from the serious issues of the day. Humankind loves a debate, and this one was low stakes and quirky that didn't involve politics, war, the environment or the big hot button topics we endlessly debate. But it was a major mind melt and eye opening for a lot of people who are very sure of themselves and their opinions being correct. There's a good psychology/sociology object lesson here. Maybe two very divergent points of view can both be correct on some level. And ultimately, something that gets people connecting, debating, thinking, sharing, parody creating, geeking on science, and laughing can't be all bad. Embrace the great dress freak out, llamas on the loose, and the lovely absurdity of reality. Truth is stranger than fiction and the truth is rarely black and white or even always black/blue, white/gold.